Background Oncology patients are more at risk for drug related problems because of treatment with (combinations of) anticancer drugs, as they have a higher risk for organ failure or altered metabolism with progression of their disease. Objective The aim of this study was to characterize and to evaluate the frequency of potential drug related problems (pDRPs) among oncology patients. Setting Outpatient- and day-care centres for Internal and Pulmonary Medicine at the Deventer Hospital, Deventer, The Netherlands. Method A prospective, descriptive, observational study was carried out from March 2010 to March 2011 at the Deventer Hospital, Deventer, The Netherlands. All patients older than 18 years receiving anticancer drugs prescribed by an internal medicineoncologist or pulmonologist-oncologist were included. Main outcome measure The primary outcome was the number and type of pDRPs according to Dutch guidelines. Results Among 546 patients with cancer, 952 pDRPs were identified, of which 474 were oncology-related. 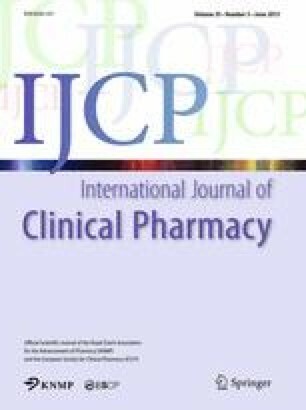 These were mainly drug interactions (IA) (246 IA in 157 patients) and potential contraindications (pCI) (201 pCI in 143 patients). Conclusion Most identified pDRPs in cancer patients were IAs and pCIs and involved corticosteroids. The most frequently occurring oncology-related IAs were classified as minor or moderate levels of severity. The authors are grateful for the substantial contributions to this study of G.J. Altena, G.J. Borst, S.D. Boor and F. Karabulut, MSc students in pharmaceutical sciences, M.M. Voogel-Fuchs, staff member oncology, and of M.E.L. Arbouw, PharmD, PhD, Deventer Hospital, Deventer. Association of Comprehensive Cancer Centers. Dutch cancer registration [database on the internet]. Amsterdam: Association of Comprehensive Cancer Centers [cited 2012 November 17]. Available from: www.iknl.nl. Dutch Health Care Inspectorate. Circulaire 2005–6 cytostatica [report on the internet]. The Hague: Dutch Health Care Inspectorate; 2005 [cited 2012 November 17] Available from: www.igz.nl. World Health Organization. International statistical classification of diseases and related health problems, 10th revision (ICD-10)—Dutch [database on the internet]. Geneva: World Health Organization; 2005-2011 [cited November 17]. Available from: http://class.who-fic.nl/browser.aspx. Arizona Centre for Education and Research on Therapeutics. QT drug list [database on the internet] Tucson: Arizona Centre for Education and Research on Therapeutics [cited 2012 November 17]. Available from: www.azcert.org/medical-pros/drug-list/drug-lists.cfm.